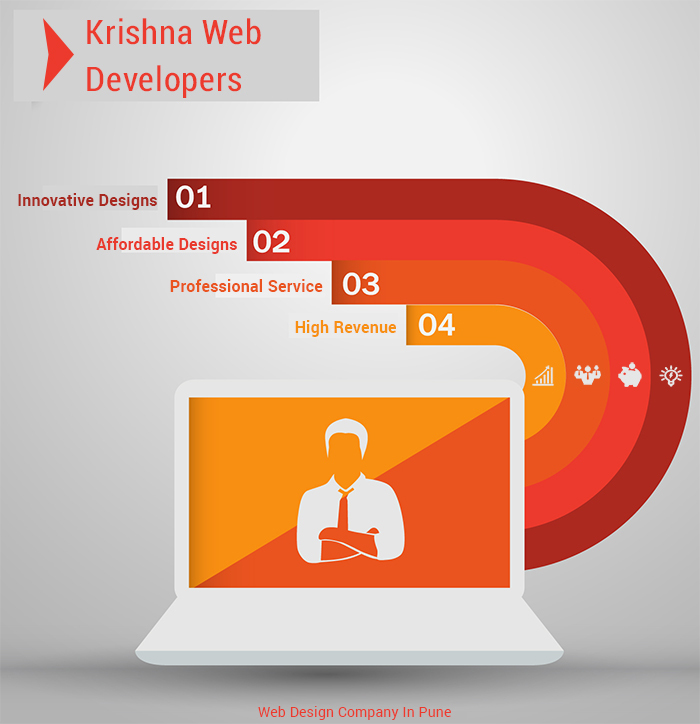 Krishna Web Developers is the best web design company in Pune. It is a leading and offshore web design company in Pune, catering variety of end to end website solutions. We have a team of highly qualified and expert creative team who are capable of designing best web design with unique ideas. Our team of experienced web designers design websites that engage visitors and generate higher sales for web business. Krishna web developers budge for best web design package is a great amount of thoughts for unique and custom business needs. We are web design Company in Pune who rank high because of creativity usability and functionality. You Express, We Design With years of experience, and we are now expertise in custom web design. For best web design we follow only three rules. We believe that webpage in a platform for our clients to convey their message clearly that’s why very smartly and neatly we developed web design. Krishna web developers Team is intelligent in way to arrange each and every section on web page so that each visitor on website definitely browse it in detail. We use this process to ensure the project scoped and planned and to define the web design requirement and overall strategy before any work commitment. Our experts will sit with you and discuss what your specific needs are. After the interactive session, we gathered desired information responsible to finalize strategies and actions to meet your goals. At the end of this process we give our team members a guideline to web design a vision in their minds and formulate an execution plan to design mock ups for your website. Krishna Web Developers reputation as best web design company in Pune and it has been built on our ability to imagine and deliver excellent creative work. After strategy planning and initial questionnaire session, we undertaken wireframes and mockup work. This stage witness a number of reviews, changes and approvals to reach a final understanding about wireframes and mockups prepared by us and finally web design approval. We are the best web design company in Pune as we conceptualize logical and design solutions and map them to practical perfection here. We know the value of your time and thus take every possible step to speed up the development process. Once the completion of the development process, we upload the web design on our servers for testing. We expect feedback or comments based on which required adjustments will be made. After the ensuring the smooth migration of developed and tested solution to the live environment we come towards the completion and delivery of project. We take each process very seriously, we want you to be happy and that’s our only job that why we are the leading web design company in Pune. We always use latest technologies HTML5, CSS3, etc. and our web designs are compatible with all latest browsers like IE10, Omega, Chrome, Firefox etc.